Initiates who spent years studying black magic achieve great powers and an higher rank in the Crimson Legion. 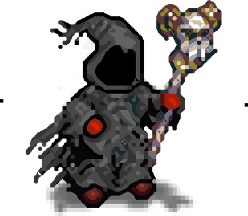 These powerful mages are known as Spellcasters and are feared because of their mastery of magic and their cruelty on the battlefield. Spellcasters use powerful black magic based on darkness, but they abandon the studies on healing magic, so they cannot cure their allies. Last updated on Sat Apr 20 01:40:06 2019.